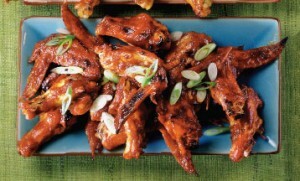 Barbecued Chicken recipe by Sana Zehra Rizvi at DesiRecipes.com. Preheat broiler, heat a charcoal grill until coals form white ash, or preheat a gas grill to medium. garlic and thyme. Mix well and bring to a boil over mediumlow heat. Cook, stirring frequently, until thickened, for about 5 minutes. Brush tops of chicken pieces lightly with sauce. Place chicken , sauce side down, on a foillined broiler pan or grill rack. Brush other sides lightly with sauce. Broil or grill 3 inches from heat, basting with remaining sauce and turning until no longer pink in center, for about 5-7 minutes per side. Let chicken stand for 5 minutes before serving. When time is short, omit the sauce.